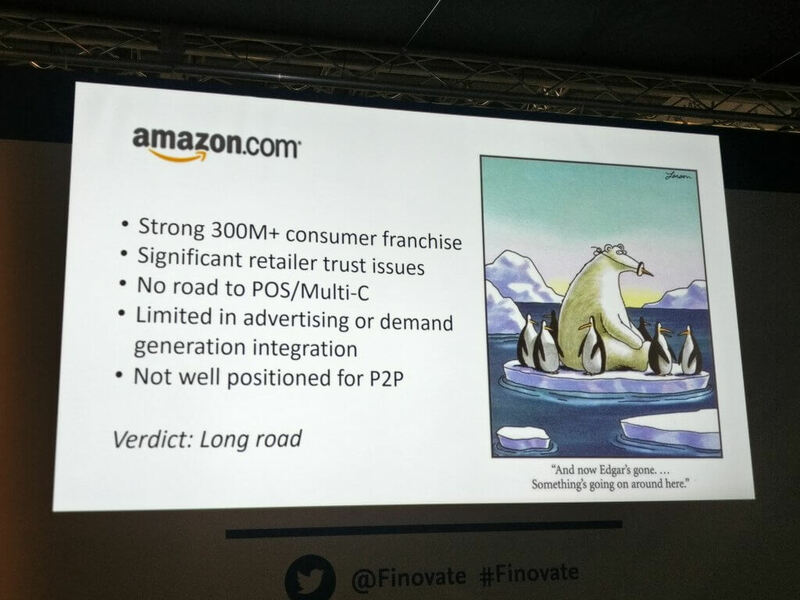 The fourth and last day of FinovateEurope 2018 was full of insight. Here are the highlights of the last day. 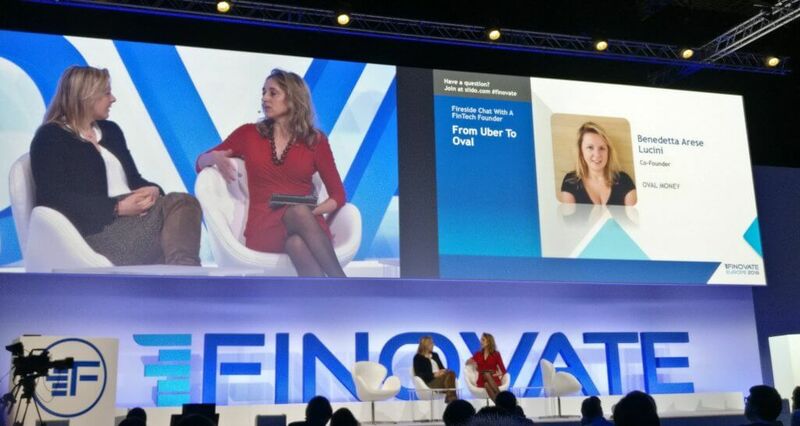 We kicked off the day with a “Fireside Chat” with Benedetta Arese Lucini, founder of the FinTech Oval Money. Oval Money gives people access to a digital piggy-bank where users can track spending, learn how to save better, save and invest automatically. Their objective is financial inclusion by targeting a group of customers who have been underserved by financial providers. What has your previous experience taught you? Lucini worked at Uber in Milan. She told us the three main lessons she learnt from working at Uber that have helped her in creating and growing Oval Money. Lesson #1 – Delivering a service in a different way. Benedetta’s parents couldn’t understand why, after years of paying for her education, Benedetta was going to work for a taxi company. While Uber was delivering a taxi service, it provided a platform that was convenient, inexpensive and safe for taxi drivers and customers. Benedetta understood the importance of using technology to make a traditional service incredibly simple. Lesson #2 – Scaling (with somebody else’s money). Uber only had 100 people in US and less than 10 outside the US when Benedetta started working for them. Milan was the twentieth city that Uber launched in. For Benedetta, one of the most important lessons was to see how Uber grew. The importance of hiring a good team and creating a good culture. Scaling up must be people and community focused. But it is also a transformational process and it is important to manage that change. Lesson # 3 – The importance of Regulation. Oval Money has acquired its licence with FCA. Benedetta thinks that regulation is simpler in finance than in transport regulation. With transport, as well overarching EU regulations there are variations at every level – country, region and city. These regulations sometimes contradict each other, making for a difficult environment. Finance, while heavily regulated, has fewer levels of regulation. Benedetta thinks that PSD2 has simplified the landscape and highlighted what is important at a European level. Oval was built with that in mind. Like Uber, which is a marketplace, Oval tries to structure itself as an intermediary. Traditional providers have realised that they are lacking a growth in a number of user segments. The problem is flexibility. Oval Money wants to provide customers with personalised products, something that is anathema to traditional banking. Benedetta offered the example of developing income insurance for a population that has flexible income. The insurance companies have a “one size fits all” solution but Oval Money is working with them to make insurance products more flexible. What is Oval Money’s focus? For now, Oval Money is focusing on Europe, mainly Italy and the UK. According to the stats, Italy is a high-saver country, while the UK shows lower stats in savings but is high in the credit market. In the same way that Uber has become an alternative mode of personal transport, Oval Money wants to become an alternative to personal finance management. Oval is focusing on targeting people with flexible income, 50/50 gender split, 20-40 years old. In addition, Benedetta highlights the importance of collaborating with the incumbent banks. Incumbent banks are here to stay and cooperating with banks will be more fruitful than competing with them. Our next speaker was Hassan Al Duhain from Saudi Arabia General Investment Authority. He told the audience that the Kingdom of Saudi Arabia’s objective is to remove their dependency on oil and gas by 2030. Their vision is to become a hub for FinTech and ICT in the Middle East. Part of their initiative is to upgrade their infrastructure and they are on track to launch 5G in 2020. There is a strong government commitment to grow the ICT sector. 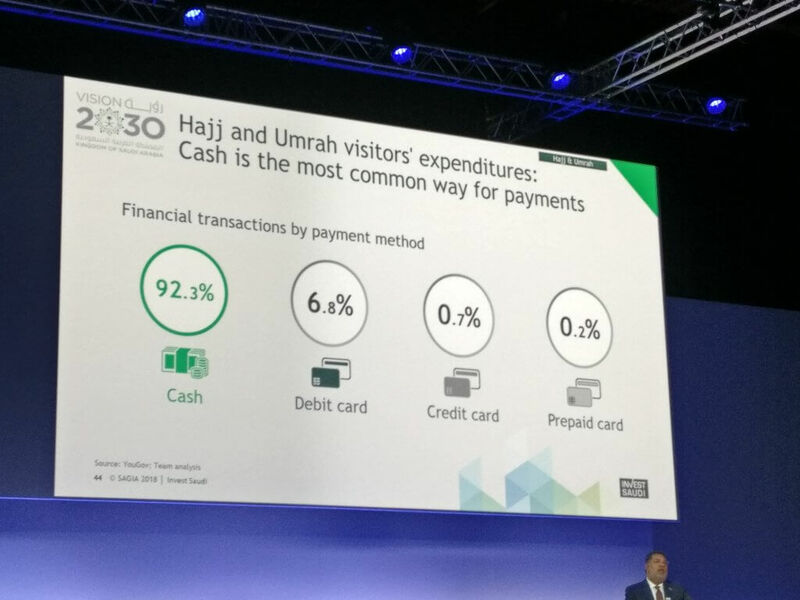 In addition, 92.3% of transactions are paid in cash. Hence, there is an incredible growth opportunity to move into card payments. Payments Summit – What Are Digital Giants Apple, Facebook, Amazon, Alipay & Tencent Going To Do To Payments? Who Will Disrupt Them? Rennier Lemmens, Chairman at TransferGO, spoke about the digital giants and how they will disrupt payments. Amazon has a long way to go to disrupt the payments’ industry, according to Lemmens. While they have over 300M customers, there seems to be no road to point-of-sale or multichannel strategy and they are not well positioned for peer-to-peer payments. Google might not be a disruptor either. 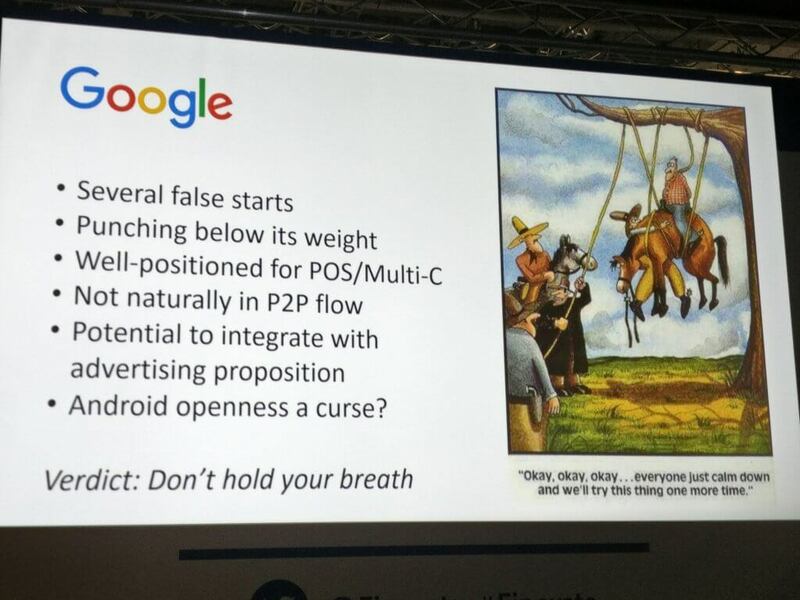 While they have positioned themselves well at the point-of-sale, have a multi-channel strategy and could potentially integrate a payment solution to their advertising proposition, several failed attempts in the past and the open source nature of Android might mean that others could develop better payments solutions on top of Android. They have the potential to become a disruptor in the payments space but they are not there yet. Ant Financial has a mobile first and mobile only strategy. They have focused on China and the far east and have become a 2.8 trillion business in mobile payments. Ant Financial plan to acquire U.S. MoneyGram International which would give them a huge bump in the money transfer business globally. Their financial services are huge but still have some work to do if they want to be in the payments space. WeChat is a very powerful business but it has focused on China only. It has a mobile-commerce-only strategy, which has created several trillions of transactions volume. It is the best-positioned provider for POS and P2P. It sees payments as a means to close the payment advertising loop. 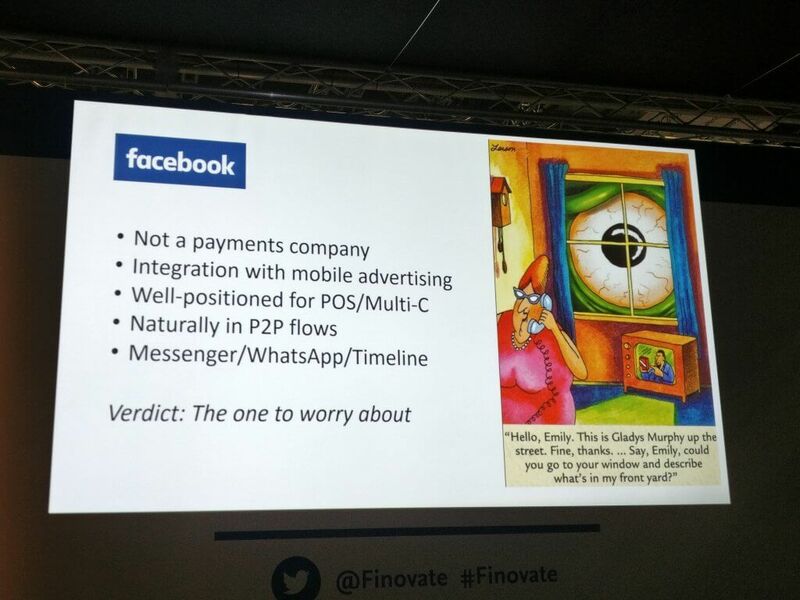 Facebook could be the one that is the closest to disrupt the payments space. It is unlikely that these digital giants would want to become banks. Out of Facebook is the one to worry about. Many FinTechs offer features that can be copied or acquired by other FinTechs or incumbents. For now, the long tail of small merchants will remain a safe haven. The Chinese dragons are miles ahead on mobile payments but still focused on the east. Based on the ubiquity of their channels to consumer and information, Google and Facebook are in a better than Amazon. Fireside Chat: AR/VR – Is Augmented Reality Hot & Virtual Reality Not In Banking? Nick Telford-Reed, Director of Technology Innovation at WorldPay told us about a proof of concept that demonstrates how shoppers could pay for things using their bank card while inside a VR environment. Authentication in payments is a battleground between retailers and regulators. Julian Sawyer, Chief Operating Officer at Starling Bank, says that open banking is forcing companies to work together to provide more value to their customers. Starling Bank operates a financial service marketplace with a range of products from both incumbents and challenger banks. Starling provides a single point for Know Your Customer (KYC) compliance checks, so it is very easy for the customer to open an account and sign up for products within their marketplace. Free from legacy systems and with a balanced team of experts in finance and other industries, Starling can move quickly to exploit new opportunities. The bank is built on AWS, iOS and Android – a far more secure infrastructure than that which incumbent banks are using. The future, according to Sawyer, is not “Fintech vs Banks” but rather a movement towards a different type of engagement involving both. The complexity of anti-money laundering (AML) and KYC regulations is phenomenal, and will seriously impact the future of micropayments. How will you process so many transactions while remaining compliant? Can providers really carry our KYC processes for every micropayment? Nick Kerrigan, Managing Director of Future Payments at Barclaycard, told us the speed of change in technology enables Barclaycard to cover consumer needs while driving commercial value. He thinks that collaboration makes the ecosystem much more productive. For example, Flux, supported by Barclaycard innovation program, is now in the Starling marketplace. They have also experimented with new initiatives, like “Grab and Go”, to follow the trend of invisible payments; and “Dine and Dash” which allows customers to pay their bill (with their mobile) and just walk out. Barclaycard has invested a lot in updating legacy systems, in building strong APIs to allow for third-party providers to capture data through APIs instead of screen scraping. Customers are looking for enhanced control. Kerrigan noted that companies shouldn’t kid themselves thinking that they will control where the consumer wants to be. If consumers are in Messenger or Facebook, that’s where Barclaycard must go. On the topic of the Internet of Things (IoT), Kerrigan stated that a lot of work still needs to be done on identity and authentication. How does as a bank know that a customer has allowed their fridge to buy milk? This hasn’t been resolved yet and authentication must catch up. When asked about blockchain, Kerrigan said that it is a solution looking for a problem. 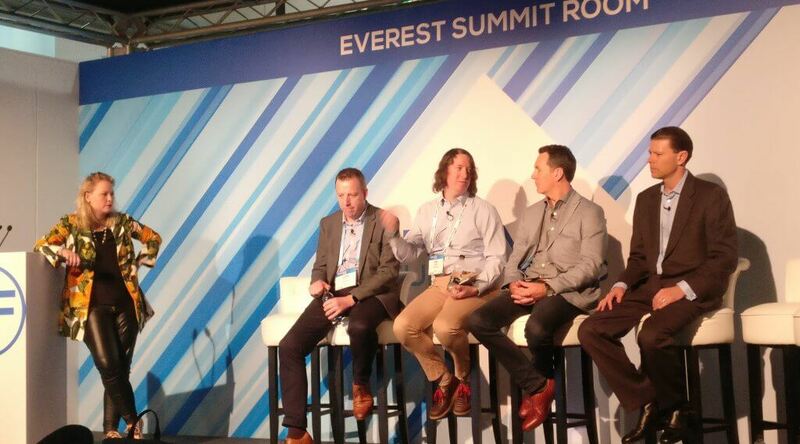 Ian McDougal, UK Country Manager of Stripe, noted that the complexity of payment processing that has spawned so many startups is a result of legacy systems rather than an inherent requirement. Payment platforms like Stripe are powerful and flexible tools for internet commerce. Merchants want to provide customers with simple platforms and plenty of choices. Platforms like Stripe allow this. Stripe has worked to equip developers with the tools they need to build a successful business using their payment platform. One of the biggest obstacles for Stripe is trust. People often have 20-year relationships with their banks and feel unsettled trusting a startup to authorise payments. McDougal believes that Open Banking will provide consumers and small businesses with more flexibility. Braden More, Head of Partnerships and Industry Relationships of Wells Fargo, feels that the industry is changing because of what technology enables us to do. In the US, there is no open banking initiative and there is incredible fragmentation. Wells Fargo has been at the forefront of faster payments and, more recently, with the Zelle integration. They have also developed APIs and defined an architecture that provides both customers and third-party providers with a safe place where customers don’t have to share their passwords and Wells Fargo becomes their home base. He said that technology should be used to guide customers to the best product and platform at the right price. Wells Fargo has always supported collaboration but the rise of FinTechs has forced them to raise the bar. Strategy Roundtable: The Rise of Crypto Capitalism – What are the challenges around ICO funding? An “Initial Coin Offering” (ICO) is the fundraising process for new cryptocurrency ventures. So far, it has been used by start-ups to bypass the rigorous capital-raising processes set by venture capitalist and banks. 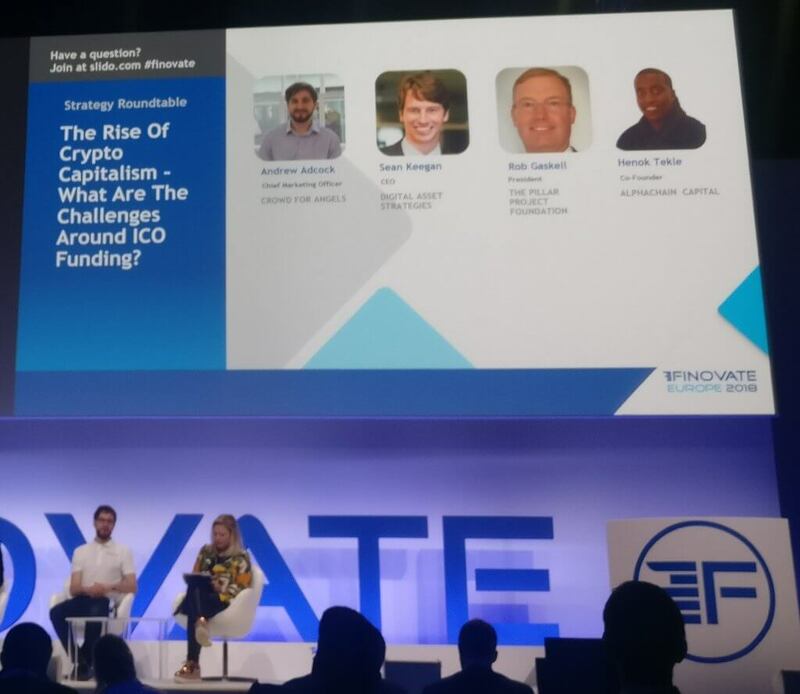 While some would argue that ICOs are a short-lived fad, with most ICO tokens considered worthless, the panellists have seen more clarity in what constitutes a security token. A project raises money in an ICO with the intent of realising a project. There have been more concrete authentication processes put in place, like requesting passports and selfies from investors and companies. KYC processes are critical and automatic verification of documents would be an ideal next step. Reporting is still in its infancy but the government should focus on that instead of providing other guidance or regulations. The panellists have seen a lot of self-policing in this space. While standards and protections are being evaluated, investing in ICOs is high-risk and as with any investment, investors must diversify their portfolio. As a grand finale, we saw seven demo sessions of seven minutes, each with one accelerator and two of their start-ups. Sophia Bantanidis, EMEA Head of Regulatory & Market Strategy of the Citibank Accelerator, introduced Hedgewiz and Exate Technology. Hedgewiz is a B2B solution that offers professional currency hedging. Exate Technology is a middleware solution that enables owners of confidential data to take control over who can view it. Michael Dooijes, Managing Director of Startupbootcamp FinTech & Cybersecurity, presented FinCom and Hatch. FinCom is a non-intrusive cloud solution that checks spelling and typos in names. Almost instantly, it provides an alternative list of names with the correct spelling whose identity can be verified to comply with AML and KYC regulations. Hatch Money is a digital bank dedicated to the self-employed. 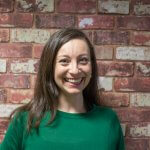 Gabrielle Inzirillo, Director of Plug And Play at the Plug And Play Accelerator, which is sponsored by BNP Paribas, announced Nicolas Meric from DreamQuark and Francois Nadal from OneUp. DreamQuark is an AI focused on financial services that allows business to create a model that suit their needs, track changes in model and report on individual decisions of the algorithm that can be explained to customers and regulators. OneUp is an online accounting software for small business owners and accountants. It syncs with the business bank account and learns form transaction history to automate accounting as much as possible. Valentina Isakina, Managing Director of JobsOhio introduced ID-Pal and Hexanika. ID-Pal is an identity verification solution that allows businesses to onboard customers quickly. Hexanika is a big data analytics company focused on banking. It offers a Hadoop solution that integrates and manages structured and unstructured data. It also features an automated reporting tool focused on US regulation. Topi Jarvinen, Managing Partner of Nestholma FinTech, presented the founders of Smartcalling and GetJeny. Smartcalling is a solutions provider that allows companies to fully personalise and brand the customer call screen mitigating customer reluctance to answer the phone when it’s a call from an unrecognised number. GetJenny is an open source conversational engine that automates conversations in any language. Max Kelly, VP Strategy & Innovation of Techstars, introduced the CEO and founder of Simudyne and ShieldPay. Simudyne is a secure simulation SDK. Simudyne trains intelligence in high-fidelity simulated environments to make better decisions. ShieldPay is a digital escrow service. The customer creates a transaction indicating who the funds will be sent to while ShieldPay verifies their identity. The funds are then transferred and are held securely in the Shieldpay vault. When both parties confirm they are happy, the funds are released. Finally, Marisol Menendez, Head of Open Innovation at BBVA, introduced Borja, co-founder of Micappital and Guillermo, co-founder of Bnext. Micappital is a Fintech that helps customers create plans for their savings and investments. Its technology connects to the customer current account to provide personalised advice. Bnext is a fully digital bank with an open API that can link to other bank accounts to provide a full spending analysis. Hope you’ve enjoyed our round-up as much as we enjoyed the event. Contact us if you’d like more information about anything we’ve talked about!